Burbank, CA – Record breaking crowds flood martial arts’ Dragonfest convention last weekend at the Marriott Convention Center. The martial arts equivalent to San Diego’s ComicCon, Dragonfest was filled with martial arts enthusiasts, anime fans and action celebrities including Michael Jai White, Joe Mantegna, Don Wilson, Cynthia Rothrock, the Consul General of Japan Akira Chiba and many more. Celebrating its 13th year, Dragonfest is dedicated as a charity event with 100 percent of the proceeds going to benefit the Martial Arts History Museum in Burbank, CA. “Several thousands of people were able to enjoy a fun day of meeting and greeting their icons, buying martial arts items and even getting their names written in Chinese,” says museum president Michael Matsuda. The event featured over 100 vendor booths that including Asian gift items, martial toys and weapons, stuffed animals, anime items, cosplay characters and even Bruce Tea. From children to adults, if you enjoy martial arts movies, you would have enjoyed Dragonfest. This year, Dragonfest relocated to the Burbank Convention Center with positive results as thousands of fans enjoyed this unique festival. “My first book came out, ‘A Filmmaker’s Journey,’ and I thought that Dragonfest would be a great place to introduce it to the public and I was very pleased at my results. This is the platform for anyone that has anything to do with the martial arts and it was twice the size as last year. It was a great event for me,” says film director and author Art Camacho. The museum is in need of a larger location in order to support the growing number of request for museum visits from many of the surrounding school districts. The goal of the museum is to teach young people about Asian culture and tradition and its connection with the martial arts. Many of Dragonfest celebrity list for last weekend included James Lew, Eric Lee, Benny Urquidez, Tak Kubota, Douglas Wong, Carrie Ogawa-Wong, Simon Rhee, Americus Abesamis, TJ Storm, Calvert Davis Miles plus anime artist Christophe Vacher, Jerome Lu, Eleazar Del Rosario and so many more. 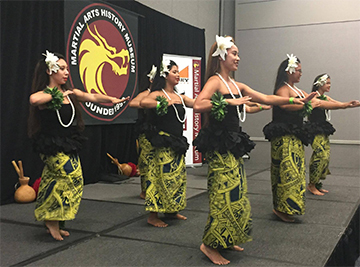 This year, Dragonfest gave a special tribute to the military as well as a number of cultural performances such as Hawaiian dancing, Chinese Lion dancing, Filipino dancing, Taiko drumming, Samurai sword cutting, sumo wrestling and a martial arts demonstration from Vince Cecere from the show, "Call Vinny." “Last year’s Dragonfest was in Van Nuys but based upon our results and the cooperation of the Burbank Marriott Hotel and Convention Center, I think we have found a permanent home for Dragonfest,” concludes Matsuda. Donations can still be made to the Martial Arts History Museum through their website at www.MAmuseum.com or visiting the facility at 2319 W. Magnolia Blvd., Burbank, CA 91506. (818) 478-1722 or email info@mamuseum.com.